Both new and old computers can experience what’s called “coil whine,” which is a high-pitched noise that comes from the computer. It’s easy to jump to the conclusion that the noise is a sign of major computer failure or that something is broken, loose, or about to explode. Fortunately, coil whine is normal behavior. When you hear a high-pitched sound from your computer, there's no reason to assume that your computer is toast, that your hard drive is about to die, or anything like that. In fact, this high-pitched noise is really nothing more than an annoyance. If you can bear the noise, you don’t need to do anything to fix it. There are, however, some things you can do to reduce or eliminate coil whine if it’s too much for you to handle. Coil whine is a high-pitched sound some devices inside the computer case can create under certain situations. This hiss or squeal resembles a dull, boiling teapot sound, only usually much quieter. These coils in your computer have an electrical current passing through them, one that normally fluctuates, which is what the coil is there for: to try to stabilize the current to provide a more regular stream of power. When the electrical current is increased to a certain point, the magnetic field around the coil can cause it to vibrate, which produces the whiny sound. This high-pitched whining noise isn’t always heard by everyone in the same way since the frequency varies and not everyone can hear the same frequencies. In fact, most components in a computer produce a sound but it’s usually just too quiet for most to hear. Not only is the loudness of the whine dependent on the person hearing it, it also matters how much electricity is moving through the wiring and, of course, the distance the computer is from your ears! What Causes the High-Pitched Sound? Nearly any device can experience coil whine but it’s common for video cards to make a high-pitched sound since they’re often used for high-intensity tasks — like video games, graphics editing, and video playback — and are usually being used for those tasks for hours at a time. One way to verify what’s producing the noise so that you can better determine how to fix it is to pay very close attention to when the noise happens. If the noise is much louder than usual when you’re playing video games, you might blame your video card (that's probably what's causing the high-pitched sound anyway). Another way is to use a benchmark tool to test specific hardware and then, again, listen for when the noise is actually produced. If you're having troubles, you might need to hold a straw from your ear next to various components in your computer to help isolate the sound. Just please be careful when you do this! However, be careful to not confuse other noises — like pops, rattles, or clicks — for high-pitched sounds and just assume it's coil whine and walk away without addressing it. 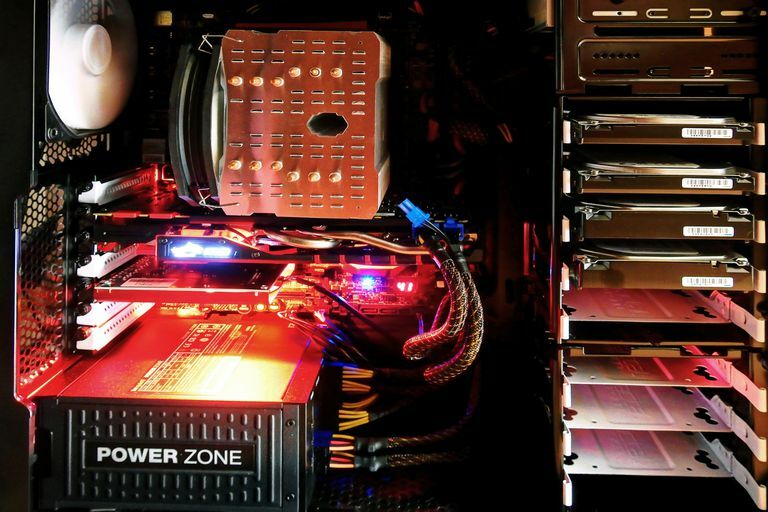 For example, a squealing noise might at first seem like coil whine but it could actually be noise from the hard drive pointing to a failing HDD, and another sound might more accurately be a sign of a rapidly overheating power supply. Even if the noise isn't coil whine, it doesn't mean that whatever it is is causing a problem. For example, if your computer makes a noise each time you're doing something like burning a movie to a disc or ripping music from a CD, that's just the optical disc drive — it's normal to hear the disc spin. In other words, it's important to listen for the distinct hissing that most likely means the problem is with a vibrating coil, in which case it can be called coil whine and you can address it as such. You might even experience a high-pitched noise when the computer is off! This is most likely an issue with the power supply. Something you can try in that situation is replacing the power cord with one that features a ferrite bead. Some “coil whine fix” solutions online will tell you that you cannot do anything to fix a high-pitched noise coming from your computer, but that just isn’t true. You’ll also read that coil whine is a symptom of a broken computer, and while it’s true that it could mean that the components making the noise are inexpensive or not designed to shield sound or vibrations, it’s not a tell-tale sign that something isn’t working. There are multiple things you can try to reduce the effects of coil whine, from addressing the wiring directly to buying or building a computer made specifically to absorb noise, but those are the more drastic solutions. Move your computer further away from you! I know, this doesn’t really sound like a good solution for actually fixing coil whine, but it can definitely reduce all those noises coming from your computer and is by the far the easiest method to try. This will obviously only be beneficial to people who have their computer on their desk, right next to them all the time. If that’s you, unplug everything and rewire your monitor(s), keyboard, mouse, etc. to have them move through the back of your desk, and sit your computer on the floor to reattach everything. If your computer doesn’t have any legs and sits directly on top of whatever you put it on, it’s best to avoid having it sit right on the floor, especially if you have carpet. Put it on a piece of wood or a lower shelf on your desk, if you have one. Blow out your computer. Open the case and use canned air to remove dust and other grime from any fans and other equipment. When these components, especially fans, collect enough dust that it slows down how they work, it can force them to run faster to make up for it, which is going to demand more power and thus produce more noise like coil whine. There are actually lots of ways to keep your computer cool. The more methods you use, the less likely your computer’s components will overheat and work harder. This should translate into a less-noisy computer. Reseat everything you can inside your computer and check that it’s all secured with screws or whatever other tightening mechanism is in place. When you’re reseating data and power cables, be sure to tie them up in a way that reduces the overall space they take up in the case. This will make sure the fans have ample space to move hot air and dust out of the computer and keep the hardware from working harder than it should. If reseating fixes the noise, it’s possible that it wasn’t coil whine but instead just vibrations from a device rattling against its own frame or slot on the motherboard or case. Something you might consider getting, if you don’t already have them, are rubber grommets (like these). They can help reduce noise if they’re installed on the hard drive or devices that often move, like the optical disc drive. Limit how hard your computer can work. This might involve lowering the maximum number of frames per second that your GPU is allowed to process or reducing the speed of your fans. If the GPU is rendering too many frames too quickly, it’s going to cause your GPU to work more than you need it to, which could be the cause of the coil whine. Similarly, you might hear sounds from your fan if they're overworking. Some video games and software programs have a built-in setting where you can change the maximum frame rate setting. Another way is to install MSI Afterburner and alter the “Framerate limit” setting in the RivaTuner Statistics Server tool, or the “Fan Speed” option. SpeedFan is another solution for lowering fan speeds. If your computer is already difficult to cool, don't reduce the speed of any of the fans. The fans are really important for keeping out hot air, so only change the fan speed if your computer isn't overheating and only if you've made the fans faster at some point, and that's why they're making noises. Make your computer case soundproof. If the case is made primarily of metal, without any soft, sound-absorbing insulation on the case or around the computer hardware, it’s much easier to hear everything going on inside it. Add some foam or a thick fabric material to the door of the case, or to the part of the case that directly faces you, or to the part of the desk that sits between you and the computer. You can get some on Amazon or places like Parts Express. It’s much easier to do add sound-protective foam to your computer than to move the whole computer into a new soundproof case. You can see an example of a soundproof computer case with this Deep Silence case from Nanoxia. Take note of the insulation on the case door. Paint insulating varnish, also called coil lacquer, on the specific coils that you suspect are causing the high-pitched noise. Once it dries, the liquid will form a thick, protective barrier around the coils that should help reduce or even completely stop the coil whine. You could also use silicone or hot glue, if you prefer. This technique seems to be a popular one for fixing coil whine but it’s obviously not the easiest method, which is why it’s so far down this list. You first have to know what, specifically, is causing the high-pitched noise before the lacquer will do you any good. Replace the part that’s making the high-pitched noise. If it’s still under warranty, you might be able to get a free replacement because of the excessive noise, but most manufacturers will not cover a replacement when the problem is just a high-pitched sound. The reality here is that the replacement will probably suffer from coil whine, too. When buying a new computer part to fix coil whine, try looking at places that have a good return policy so that, if after running a benchmark on the hardware the high-pitched noise is too much of a bother or comes on too easily, you can just return it and look elsewhere. You might also look for computer parts or whole computer systems that are made specially to absorb sound or minimize heat, either with individual parts that are insulated or a computer case that's made for the sole purpose of keeping noise inside of it and/or heat outside of it. Quiet PC might be a good start. Before committing to buying any new computer part, check the reviews and see what other users are saying about coil whine. If there are lots of complaints, you’d be wise to avoid buying anything that will just repeat the problem you’re trying to fix. If you don’t want to go as far as replacing the hardware, and nothing else worked to stop the coil whine, you’re left with just dealing with it. Since there’s nothing actually wrong with the computer when the only symptom is a high-pitched noise, you could just use noise-cancelling headphones whenever you’re on your computer. That should be enough to block or drown out the noise.